Are there enough cauliflowers in the world? SO at the moment there's a raft of 'food' programmes on the TV. What is the collective noun for food programmes? A selection box of? An aisle of? Anyway, Supermarket Secrets was the one I found myself watching last night, and as a lot of the content was plastic packaging - or its removal - I stuck with it. Some of the focus was on why in some situations plastic is still needed. Anyone wanting to see Gregg Wallace chomp on a cucumber was in luck, as that's exactly what he did. Twice. One had been packed in traditional plastic packaging. One hadn't. You won't be suprised to hear that the one packed in plastic was much nicer, crisper and generally healthier. But of course it was, it's a classic example of somewhere where the plastic is actually needed. It's all to do with the very high respiration rates of certain types of fresh produce - and plastic's the only barrier that slows it down. I could at this point mention our breathable bags and films, which slow down the respiration of fresh produce and 'put it to sleep' but we'll stick with cucumbers, and why they are packaged in plastic, which was the item under discussion on the TV. I guess it's simple. Cucumbers aren't particularly high value. So the packaging has to be cheap. Plastic works. Alternatives are too expensive, not using anything means too many get thrown out. Someone somewhere has done the maths and it added up to plastic. So perhaps plastic is, in this case, the correct solution. The alternative solution would be more expensive cucumbers. Plastic isn't inherently bad. It's just that there are many applications where it is used and doesn't need to be. Or despite people's best intentions, doesn't actually get recycled. It's always a programme I get sucked in to. Some of the science on there is genuinely fascinating. Who knew electrocuting potatoes before making crisps was a thing? And I have also found myself getting sucked in Food Unwrapped (Channel 4? perhaps 5?) - the last episode I watched was seemingly on the subject of the whole world must turn vegan or we're the human race is stuffed. Interesting stuff, I thought, as I tucked into the bacon sandwich my daughter had made me. SO last week myself and Karl Heggarty - our horticultural sales manager - travelled to the IPM Essen show. For anyone not familiar, it's a large horticultural/flower show held there every year. Sirane has a range of horticultural products, and has had them for a while. but for various reasons they've never taken off big style. However, recent changes in various laws across Europe - as well as in public perception - are making huge differences in the world of plastic. And if there's one industry where you see a lof of plastic, it's in horticulture. Plastic plant pots, plastic trays, plastic flowers... this for us was a fact-finding mission. Is this a problem? If so, what's being done about it? 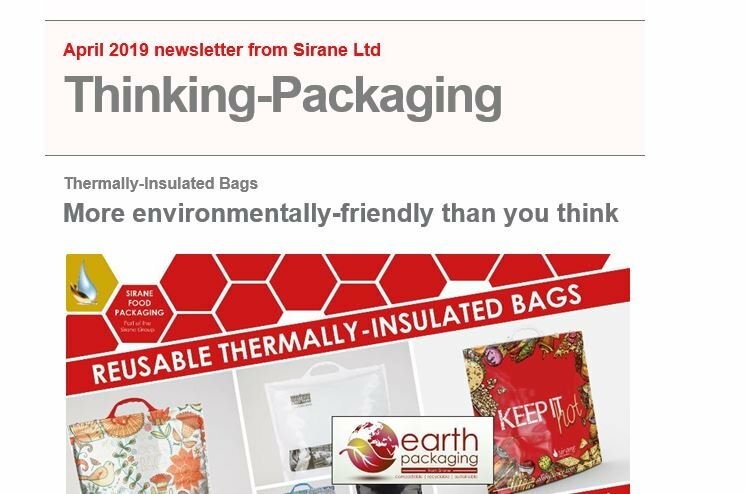 Sirane offers compostable plant pots - we've offered them for a while, but now there are definitely people within the industry willing to look and see whether it could work. Whether they're willing to change, is still an unknown quantity... as with everything like this, it'll come down to pennies. Or whether the public force their hand.